When Bruce Koeppen was founding dean of the medical school at Quinnipiac University in 2010, he made a decision that mirrored the changing technology landscape around him. The fledgling school in North Haven, Connecticut, would be a paperless institution. Koeppen made the decision after the school acquired the former headquarters of Anthem Blue Cross. The trajectory he set in motion would govern the design and renovation of the buildings, especially the library. 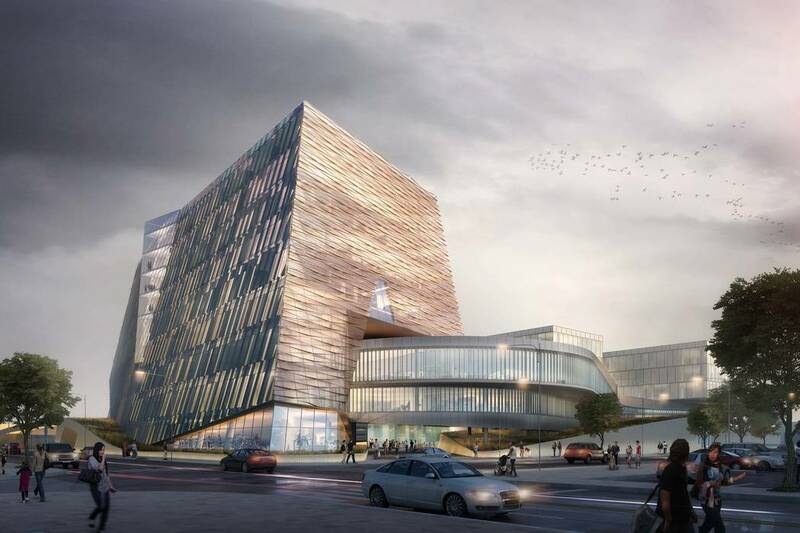 The plan for UNLV’s health sciences library — the first phase of a two-prong approach to the medical education complex in the Las Vegas Medical District — is similar in design. Since 2016, the university has added about 8,000 electronic books. Officials want the health science collection to be 98 percent electronic. But with this approach, some have questioned the necessity of a $57 million library, or “knowledge commons,” as it has been called. However, Mark Doubrava, a member of the state Board of Regents, chairman of the board’s health sciences system committee, and an ophthalmologist, says the library makes sense. Acting UNLV President Marta Meana told the state Board of Regents last month that moving forward on the nearly 49,000-square-foot space will allow the university to make use of the money that’s on hand now. The funds consist of an anonymous $25 million donation that matched the $25 million in state funds approved in 2017. Engelstad McGarry, who pulled the foundation’s $14 million commitment to the university upon news this year that former President Len Jessup was leaving, believes that a donor’s wishes should be taken into consideration. Meana, however, said that she has had conversations with donors. Nevada System of Higher Education Chancellor Thom Reilly agreed. Before Hurricane Sandy destroyed the health sciences library at New York University in 2012, the usage of electronic health journals — first appearing online in 1998 — was already a mainstream practice. By 2012, the university had eliminated most of the print versions and relocated some of the resources off-site. The adoption of e-books, which are longer in format, came along more slowly, Williams said, and a significant number of books were still onsite at the library at the time of the hurricane. However, faced with the damage, the university decided to do away with its physical collection. The 25,550-square-foot renovated library space has nearly 200,000 electronic books and more than 16,000 digital journals, and the space itself is “night and day” in terms of appearance, Williams said. The library features better lighting, sound control, support for those who bring in their own technology, group study rooms that feature flat screen displays, a library classroom that better supports group learning and a technology innovation room to support 3D printing and data visualization. The library also includes 24 computer terminals, and officials are considering adding more because they’re so heavily used. UNLV’s library — if approved by the state’s Interim Finance Committee on Oct. 24 — will feature 24/7 access to information and current research. Preliminary documents show that the facility will include an instruction room, a learning commons with seating and computers, study carrels, an open group study space, one-, four- and 10-person study rooms, a media production lab, a model skeleton storage area and an information service desk. Plans show that only 800-square-feet of space will be dedicated to book stacks. Lauren Hollifield, a second-year UNLV medical school student, said she experienced the ease of access this summer during an internship at Johns Hopkins University. She needed to look up information on post-operative pain related to hip and knee replacements. Other spaces in the building, apart from the library, include wellness rooms, break rooms, and a cafe. Farrell said officials have pulled together the “very best ideas and practices” in order to lay the foundation for the library. “By creating the library as the central hub, the central gathering place, it will help to build that community of students that the School of Medicine wants,” she said. Higher education officials also believe that moving forward with the library will protect the university from losing both the state’s monetary contribution, and the county’s land contribution. The university must commence construction on the land by July 1, 2021 according to the agreement with Clark County, but the more immediate concern is the upcoming 2019 legislative session, and the $25 million state contribution that’s hanging in the balance. Officials also believe that moving forward now is critical because of rising construction costs. A 10 percent per year inflation rate was incorporated into the $57 million figure, according to David Frommer, executive director of planning and construction at UNLV. “The sooner we break ground on something, I think we’re better off,” Doubrava said. The library will also help to support the school’s desire to increase the medical school class size beyond 60 — the number that’s currently permitted through preliminary accreditation. In addition, officials hope that movement now will spur additional investment from community donors on the second phase of the project, which is estimated to cost $182 million. GEORGIA CHARTER SCHOOL RE-INSTITUTES PADDLING WITH PARENTAL CONSENT…THOUGHTS?